My social experiment isn’t going to well, at this point I have three new friends, all three I have one friend in common with, the one that posted on here FB Wall that the experiment was in progress. As you can see one of her friends advised against it as she had recently been on a legal seminar on social networking. It did ask why but got no response. I am a bit curious as to why there is a link between the law and social networking at this point. What could the actual implications be? 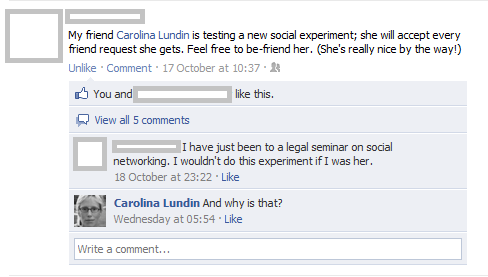 Facebook Legal Implications Social Experiment Why does it have to be so hard to make new friends?